I'm kicking off the month with some wines by Domaine Boyar. Domaine Boyar was established in 1991 and was the first private winery in Bulgaria to be founded after communism. Although the winery is based out of Sofia, all of the wines I'll be reviewing from them are from Thracian Valley. 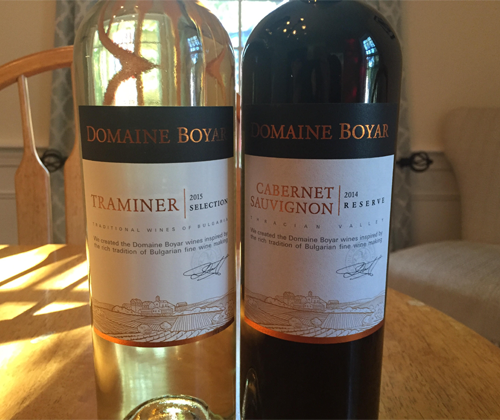 I reviewed Boyar's 2013 Traminer two years ago, and it's time to revisit with the new vintage. It was ferrmented in cold temperatures in 100% stainless steel and kept on the leese to be stirred for more flavor. After that it was racked and filtered. It has a 12% ABV and the cork is synthetic. There's more character to the 2015 than the 2013. That was just simple lychee nut and nothing else to offer, but now there's flavors and aromas of lychee nut, grapefruit, ginger and cardamom. 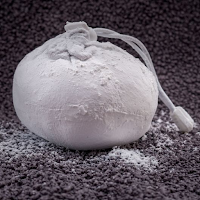 It has a light body with low acidity, and all flavor vanishes immediately on the crisp, clean finish. It's an improvement over the 2013. Another revisit. I thought the Boyar 2012 Reserve Cabernet was good for the price and gave it a 3 out of 5 in price vs quality. The 2014 is garnet in color. There's a minerality on the nose overlaying aromas of black cherries, licorice, sweet pipe tobacco, and green peppers. I really enjoyed the nose, but the mouthfeel of this wine is a real turn-off. It's grainy and dusty and not appealing at all. It even finishes disturbingly chalky, like somebody dropped a chalk ball in the barrel. Past that there's flavors of black cherry and plum, but it's kinda hard to focus on that. This was not an improvement over their 2012. Soooo... the third annual Bulgarian wine month started off okay and then not so okay. But hang in there, because I know for a fact we've got some amazing wines to try this month!